Rabbi Chaim Druckman says Jewish Home party cannot serve religious Zionist public if it merges with Likud. 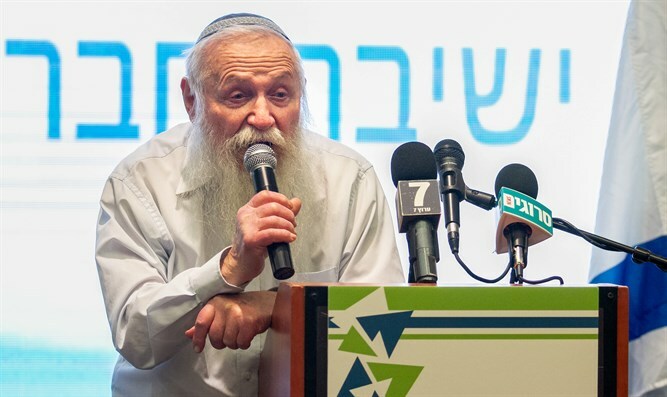 Rabbi Chaim Druckman, the head of the Bnei Akiva yeshiva network, regrets the leaks which have occurred during the negotiations for the unification of the religious Zionist parties. "The merger of National Union and Otzma Yehudit as a technical block to strengthen the camp is a worthy move," he said. "There is no doubt that the Jewish Home and the National Union should run together," said Rabbi Druckman, adding: "I cannot think of a reason for them to run separately. These two lists are the complete list of religious Zionism and should run together." "There is no doubt that with good will, it is certain that we can manage and go together and breathe life into the national religious public, when there is one list that is very vital to the State of Israel." "I'm sure it's possible," said the rabbi. "It's a shame there are leaks." Rabbi Druckman dismissed reports that the Jewish Home plans sought to run together with the Likud party. "The Jewish Home did not consider such a thing at all. These were reports that were planted, perhaps by the Likud itself." The rabbi related that he was also contacted by various parties and asked to propose such a partnership, but in his view, "this is not the right way." "These are national-religious Jews who are looking at the importance of the big party, but we are talking about a religious-Zionist conception that should be expressed in the leadership of the state, including the bridge that is to be built on Shabbat or not, and including military service and social matters. The religious people in the Likud come to the Knesset as private individuals." "The Jewish Home has a path and ideology, and it is not looking for jobs for a few Jews who will be in the Knesset. The Jewish Home speaks of the State of Israel according to the Torah of Israel and the religious-Zionist aspect that includes the perfection of the Jewish people, the Land of Israel and the Torah of Israel," he said.